Compartment syndrome (CS) occurs when the pressure within a closed anatomic space becomes high enough to compromise blood flow and the function of tissues. Late or delayed treatment of compartment syndrome can have disastrous outcomes. Muscles and nerves cannot tolerate ischemia (restricted blood supply) for longer than a few hours. After that, muscles and tissues die and nerves become permanently injured. In very severe cases, myoglobin is released into circulation and can result in kidney (renal) damage. Renal failure, infection, and sepsis can result and lead to death. Motor deficits such as drop foot can result from compartment syndrome. 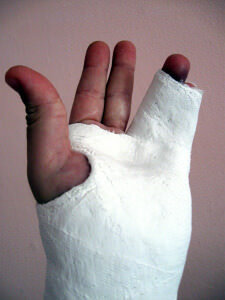 Volkmann’s contracture is another limb deformity seen with untreated compartment syndrome. Occasionally, infections develop which may go on to require amputation. Compartment syndrome is a medical emergency and requires rapid intervention. Surgical intervention is often required to relieve the pressure. Fasciotomy can be performed to decompress the area and restore muscle perfusion. As a medical malpractice attorney in the Salt Lake City, Utah area, I have handled cases of compartment syndrome on behalf of clients. One individual I represented was admitted to the hospital for abdominal surgery. Due to his positioning on the surgical table, he developed severe compartment syndrome in his hand and arm. His hand swelled to many times its original size and he suffered excruciating pain. Despite an emergency fasciotomy, he suffered permanent nerve damage and required skin grafts. His case resulted in a fairly large confidential settlement. Many compartment syndromes result from tibial or other fractures. Other causes include a tight cast or dressing, prolonged surgery, crush injuries, and deep vein thrombosis. It is important that your health care providers do everything possible to prevent and recognize compartment syndrome. Failure to do so may be malpractice. If you suspect you or a loved one have been injured due to undiagnosed or late diagnosed compartment syndrome, please give the Faerber Law Firm a call for a free consultation.